Nothing Can Stop Us (Not even a Little Rain)! Thanks to everyone who came out to the 4th Annual T.E.A.L. 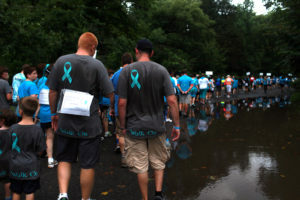 Walk this year! Even with the passing storm that so happily greeted us, we still had a great turn out, and everyone had smiling faces. Check out our photo galleries of the 2012 T.E.A.L. Walk and see if you can find a picture of yourself! It is because of you and EVERY AMAZING LADY that this is possible. 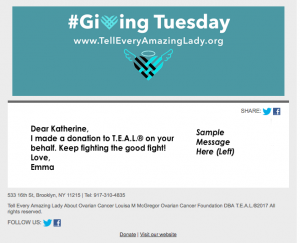 Thanks again to all who participated, and remember to tell an amazing lady in your life about Ovarian Cancer.